Welcome to the FREE Minnesota chat area. 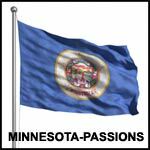 The chatroom is one of the many completely free features available within Minnesota-Passions. Please note that you will need to be a registered member of Minnesota-Passions in order to use the chatroom, but once you have done that, you will also have 100% FREE access to photo personals, email, instant messaging, blogs, Minnesota forums and more. Oh, and this site is just one of over 260+ sites in Passions Network. Once you have joined Minnesota-Passions, you will have the option to upgrade to 'Network Wide Access', which would give you access to any of the other sites within Passions Network, if you are interested.